The largest Plinian eruption of our era and the latest caldera-forming eruption in the Kuril-Kamchatka region occurred about cal. A.D. 240 from the Ksudach volcano. This catastrophic explosive eruption was similar in type and characteristics to the 1883 Krakatau event. The volume of material ejected was 18–19 km3 (8 km3 DRE), including 15 km3 of tephra fall and 3–4 km3 of pyroclastic flows. The estimated height of eruptive column is 22–30 km. A collapse caldera resulting from this eruption was 4 × 6.5 km in size with a cavity volume of 6.5–7 km3. Tephra fall was deposited to the north of the volcano and reached more than 1000 km. Pyroclastic flows accompanied by ash-cloud pyroclastic surges extended out to 20 km. The eruption was initially phreatomagmatic and then became rhythmic, with each pulse evolving from pumice falls to pyroclastic flows. Erupted products were dominantly rhyodacite throughout the eruption. During the post-caldera stage, when the Shtyubel cone started to form within the caldera, basaltic-andesite and andesite magma began to effuse. The trigger for the eruption may have been an intrusion of mafic magma into the rhyodacite reservoir. The eruption had substantial environmental impact and may have produced a large acidity peak in the Greenland ice sheet. Braitseva O.A., Melekestsev I.V., Ponomareva V.V., Litasova S.N. The history reconstruction of volcanic activity in the Tolbachik regional zone of scoria cones deduced from detalled tephra and geochronological investications // Arc Volcanism: Physics and Tectonics. 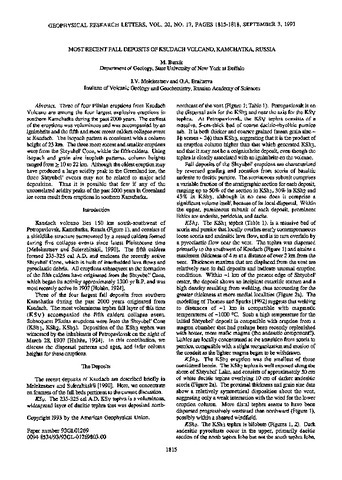 Proceedings of a 1981 IAVCEI Symposium, Arc Volcanism, August-September, 1981, Tokyo and Hakone. Tokyo: Terra Scientific Publishing Co. 1983. P. 47-48. Braitseva O.A., Sulerzhitskii L.D., Ponomareva V.V., Melekestsev I.V. 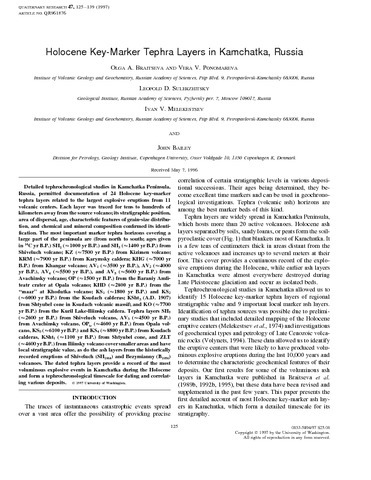 Geochronology of the greatest Holocene explosive eruptions in Kamchatka and their imprint on the Greenland glacier shield // Transactions (Doklady) of the Russian Academy of Sciences. Earth science section. 1997. V. 352. № 1. P. 138-140. 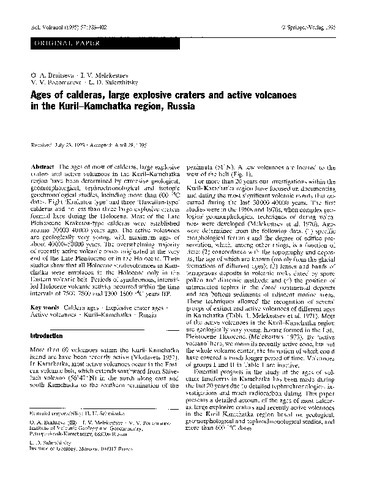 Three of four Plinian eruptions from Ksudach Volcano are among the four largest explosive eruptions in southern Kamchatka during the past 2000 years. 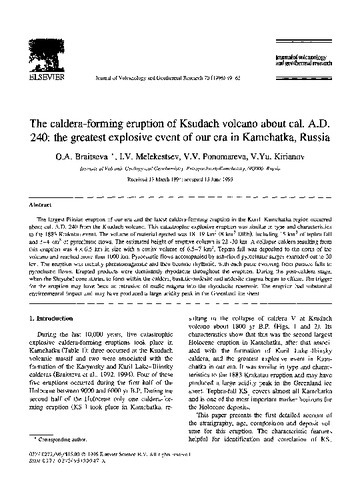 The earliest of the eruptions was voluminous and was accompanied by an ignimbrite and the fifth and most recent caldera collapse event at Ksudach. The isopach pattern is consistent with a column height of 23 km. The three more recent and smaller eruptions were from the Shtyubel' Cone, within the fifth caldera. Using isopach and grain size isopleth patterns, column heights ranged from ≥ 10 to 22 km. Although the oldest eruption may have produced a large acidity peak in the Greenland ice, the three Shtyubel' events may not be related to major acid deposition. Thus it is possible that few if any of the uncorrelated acidity peaks of the past 2000 years in Greenland ice cores result from eruptions in southern Kamchatka. Bursik M., Patra A., Pitman E. B ., Nichita C., Macias J. L., Saucedo R., Girina O.A. 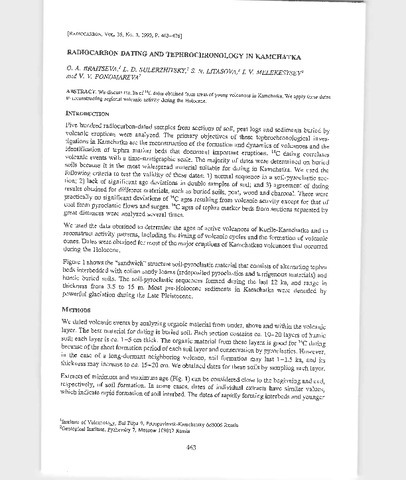 Advances in studies of dense volcanic granular flows // Reports on Progress in Physics. 2005. V. 68. P. 271-301.